Photograph of a group of European refugees visiting a U.S. battleship. 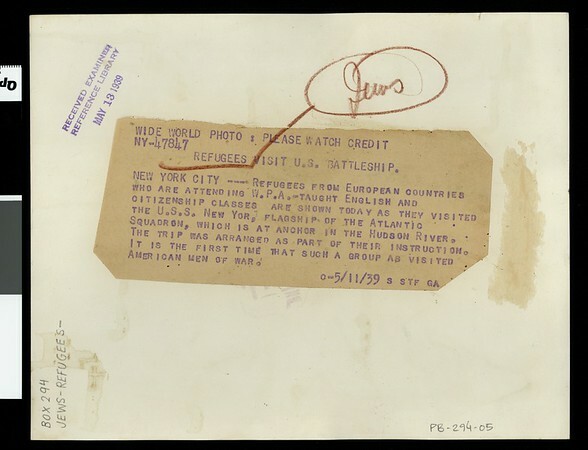 "Wide World Photo | Please watch credit | NY-47847 | Refugees visit U.S. battleship | New York City -- Refugees from European countries who are attending W.P.A.-taught English and citizenship classes are shown today as they visited the U.S.S. New Yor[k], flagship of the Atlantic squadron, which is at anchor in the Hudson River. The trip was arranged as part of their instruction. It is the first time that such a group as visited American men of war. c-5/11/39 s stf GA" -- typed note attached to verso. "Received. Examiner reference library. May 13, 1939" -- stamped on verso.